"Yum! A recipe even my kids will eat and ask for more of." Place bacon in a microwave-safe 2-quart baking dish. Microwave until crisp, about 6 minutes. Transfer bacon to a plate. Place rice and onion in the baking dish; microwave until slightly tender, about 4 minutes. Add the cooked bacon, tomatoes, water, green pepper, ketchup, salt, chili powder, and pepper. Cover and microwave for 10 minutes. 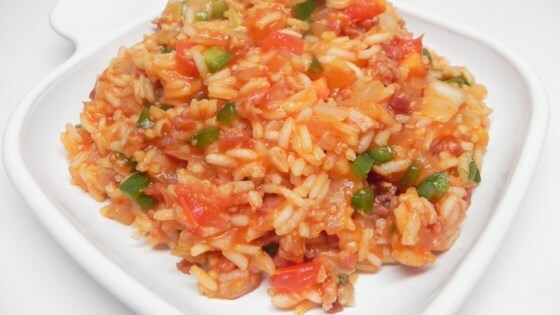 Stir mixture and continue cooking until rice is tender and flavors are blended, about 8 minutes more. Let cool briefly before serving.